Show off your branch of the Family Tree with this exquisitely crafted, Custom-made 14K rose gold Family Tree Pendant Necklace. Customized to reflect each member for your Branch of the Family Tree, this beautiful necklace is bound to become a treasured family keepsake for years to come. Each leaf (gemstone) on your branch will measure about 3mm in diameter. Branch measures 4mm x 40mm and comes with a 17 inch cable chain. 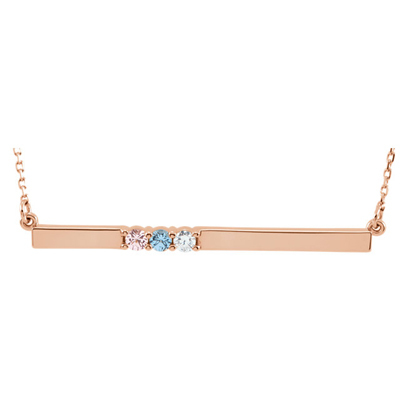 We guarantee our 3 Stone Birthstone Bar Necklace in 14K Rose Gold to be high quality, authentic jewelry, as described above.